Check out my addition of Caribou Coffee here! How was everybody's weekend? Mine was pretty awesome - hung out with friends, ate a TON, watched football (boo) and Friday Night Lights! I love that show. 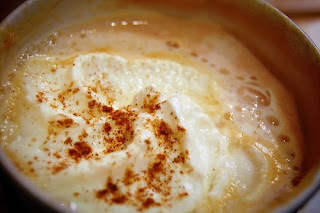 Hi Nakiya..i am guessing you are a huge pumpkin spice latte fan..your posts are inspiring me to give a try to make latte at home! If you do - let me know the recipe!! !